Our lungs are under attack. So much so that the lung cancer statistics will shock you. But cancer isn’t the only problem. Lung diseases are a massive health issue. 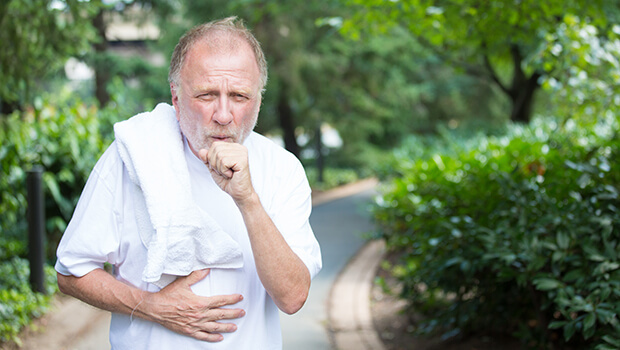 Asthma, chronic obstructive pulmonary disease (COPD), chronic bronchitis, cystic fibrosis/bronchiectasis, and pneumonia are just a few of the problems. For years, smoking was the main problem behind lung issues. But now, there are other threats. These include air pollution, mold infection, heart failure (which can lead to pleural effusion), and allergies. Dave was one of the many who was struck with a mold infection. For years, mold grew in his house without any indication it was there. The longer he lived there, the worse his health grew. He had mold remediation companies remove the mold, but his health continued to decline. Then he had mold dogs examine the house. They found even more mold. It was everywhere. After having all of it removed, his health leveled off. But he was still struggling to breathe. That’s when Dave found a mixture of nutrients that helped his lungs recover. Before he took the mixture, he took it to his allergy specialist, who muscle tested him to see if it would help. She was shocked. His body was craving these nutrients. So she told him to double the dose on the bottle. In just a few weeks, Dave saw his breathing improve significantly. He’s not fully recovered yet. But the nutrients are making a difference. So what are the nutrients that can protect your lungs from the massive assault they’re under these days? The primary nutrient you need to protect your lungs is N-Acetyl-L-Cysteine (800 mg daily). This nutrient has proven to help reduce inflammation in the lungs and the oxidative stress that causes it. One study found that it does all this and helps bronchodilators work even better in COPD and asthma sufferers. Other nutrients that help the lungs include blueberry extract (500 mg daily), Reishi mushroom extract (50 mg daily), and andrographis extract (50 mg daily). I’ll have more on these nutrients in future issues. In the meantime, you can find all of these nutrients in Advanced Lung Support. Not only will these nutrients help restore the health of damaged lungs, but they will help protect them from getting damaged in the first place. Because they fight oxidative stress, they’re great for protecting your body in many different ways.